Enough to toss with 1 pound of freshly cooked hot pasta. Try something you can twirl around a fork—spaghetti, linguini, angel hair. Or something chunky—penne, cavatelli, corkscrew pasta, or even tiny orzo, if you're so inclined. 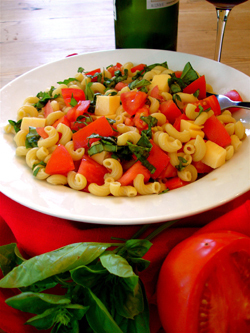 Chop the tomatoes and toss with all ingredients except the pasta. I like to do this about a half hour in advance to let the flavors blend a bit, but you can do it at the last minute, too. Cook the pasta according to package directions and then toss it all together. Serve still warm. If you like, add any of the following to customize it to your tastes and appetite. Click here for five simple steps on how to grow healthier tomatoes.